The Preschool-Oriented Programming (POP) Platform is a tool to introduce young children to programming, robotics, and artificial intelligence by allowing them to build and program their own robots. The platform consists of three parts: PopBots, PopBlocks, and PopAI. 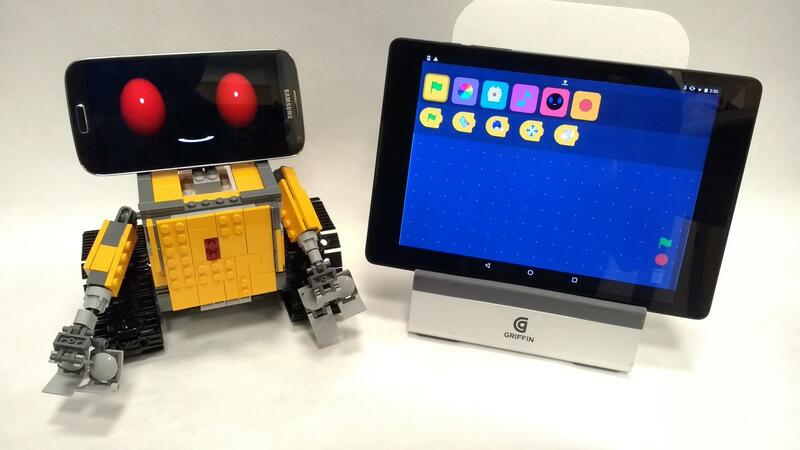 The PopBots component of the toolkit consists of a mobile phone, LEGO blocks, and LEGO WeDo motors and sensors. Children can experiment with various sensors (light, proximity, touch) and build their own robots. We preassembled some pieces in the toolkit to help children get started: a car base, a pan and tilt base, and a rotating limb. The PopBlocks component is a graphical programming language based on Scratch Jr. The blocks allow users to use sensors, run motors, change LED colors, change the robot face, play music, and trigger robot animations, appealing to an assortment of interests children may have. The toolkit includes sample programs such as an agent that greets you when you wave hello, a car that dances and changes LED colors upon hearing a sound, and a musical robot that sings different notes when you move close to it.